Looks can be decieving, a giant white blob may just be the next hero. 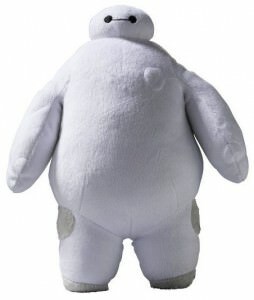 This is a 10 inch plush doll that looks just like Baymax from the Disney movie Big Hero 6, find Baymax in his nursebot look which is just a giant white blob with a little head and tiny black eyes. Baymax is made to be very soft so give lots of snuggles, another cool feature is this plush Baymax also has sounds just a simple sqeeze and you will hear phrases and sound effects from the Disney movie Big Hero 6. Snuggle up with the Disney’s Big Hero 6 Baymax 10 Inch Plush Doll.